One movie told in three distinct chapters using a trio of young performers joining forces to portray a single character, linked not by their physical resemblance but by a shared ability to convey the essence of that character’s soul. Add to that an ensemble stuffed full of talented but under-recognized acting vets and a critically acclaimed director coming off a seven-year hiatus, and voila! You have the raw ingredients of Moonlight, a chaotic mix that could just as easily have resulted in fiasco, but has instead garnered six Film Independent Spirit Award nominations: Best Feature, Director, Screenplay, Cinematography, Editing and the Robert Altman Award for ensemble cast. But long before Barry Jenkins’ moody self-actualization triptych claimed this year’s Robert Altman prize (already awarded) we were already obsessed with the film’s unique approach to casting. And film fans got the chance to dig even deeper on February 1 during the first night of Film Independent’s 2017 Directors Close-Up series. 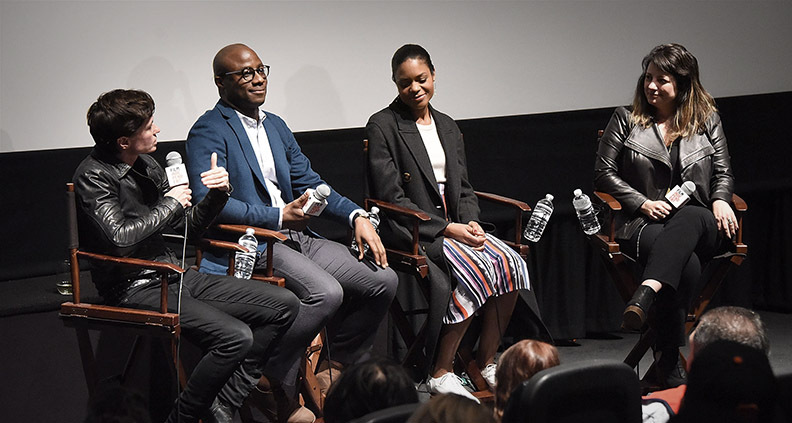 The panel, called “Moonlight: A Stellar Ensemble Piece” and held at West LA’s Landmark Theaters, featured Jenkins, Moonlight casting director Yesi Ramirez and star Naomie Harris in a panel moderated by Boys Don’t Cry director Kimberly Peirce. Sheepishly, Jenkins admitted that Harris—whose portrayal of Paula, Moonlight protagonist Chiron’s desperate single mother, has earned the native Londoner an Academy Award nomination—was not his first choice for the role. 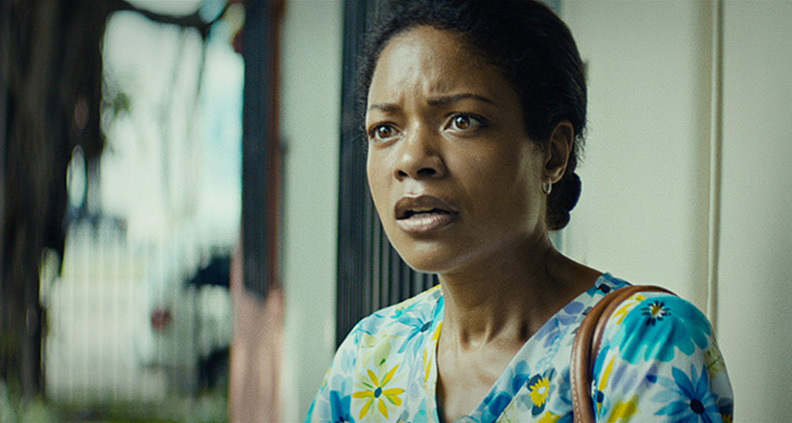 “I didn’t think someone with an English accent could be my mom,” he said of the part, which like much of the screenplay was rooted in the director’s own experience growing up in the Miami housing projects. Jenkins jumped in. “I don’t do positive or negative role models,” he said, insisting his goal was to portray stories with authentic characters. “What I meant was ‘non-stereotypical’,” clarified Harris. To this, Jenkins theorized that the neglectful, crack-addicted black matriarch was an archetype that loomed far larger in audiences’ imaginations than has actually existed onscreen, stating that he could only think of a few tangible examples of such characters. Peirce asked Jenkins about the film’s unconventional structure, noting that Harris was the only actor to reprise their part across all three chapters (Monáe appearing only in first two—“Little” and “Chiron”). Jenkins said that this was the plan from the start. “For me it was the Lynn Ramsay [Ratcatcher, Morvern Callar] school of filmmaking. A mix of trained and untrained actors,” he said. Jharrel Jerome, then a 16-year-old student at LaGuardia High School student soon followed, playing the teenage version of Chiron’s (sort of) BFF “Kevin” opposite Sanders in Chapter Two. With a chuckle, Jenkins praised Ramirez’s ability to read against actors during the auditioning process—an underrated skill that all casting directors should keep in their back pocket. He claimed to still hear Ramirez’s voice every time André Holland (who plays Kevin in Chapter Three) asks Trevante Rhodes’ grown-up, tough-guy Chiron, “Who is you?” Throwing to the clip in question, the Landmark audience chuckled as Holland delivered the line. Even more impressive, Harris filmed her entire part in three days in-between promotional obligations for the James Bond film Spectre. 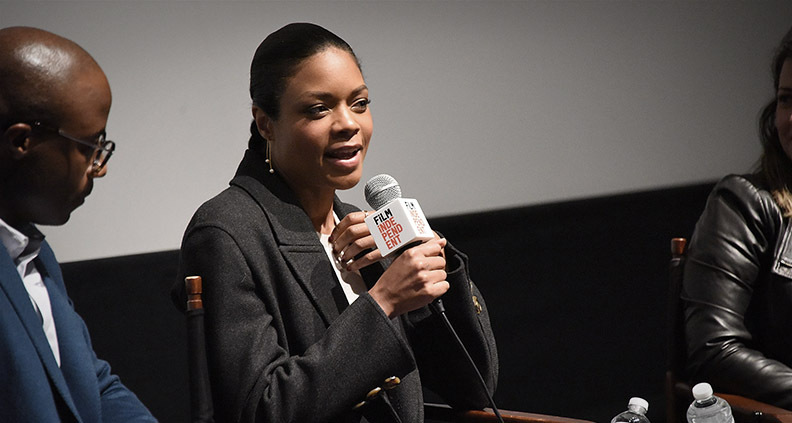 “The biggest thing I wanted to get across is that the brutality [Paula] puts on her son has more to do with her own self-hatred,” she said of her Oscar-nominated performance. Wrapping up, Peirce opened the floor for a brief audience Q&A touching on a variety of topics, from building a sustainable career in the arts to advancements in digital cinematography allowing for more expressive photography of black faces. The evening wrapped, and Jenkins & Co. immediately rushed to a waiting car to be transported to a Moonlight screening in Santa Monica—once more trying to get in as much work as possible in very little time. To learn more about Film Independent’s Directors Close-Up, including how to attend, just click here. For more information about Film Independent, please visit our website or subscribe to our YouTube channel. Learn how to become a Member of Film Independent by clicking here.